I'm in Love with this Series! 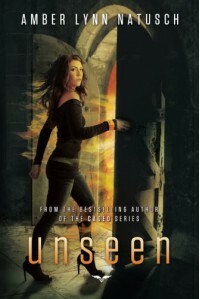 Unseen was simply awesome, it picks up right after Unbornleaves off which helps you quickly transition right back into the story. While Unborn had set the stage, Unseen takes Khara back to the Underworld where she grew up and reunites her with her adoptive father Hades. However, her time in the Underworld isn't what she was expecting it to be, an her new status has made her even more of a walking target for not only the evil lurking in the Underworld, but also for those she considered family. I LOVED the relationship between Khara and Oz in this book, the tension between them really helped to set the mood for the rest of the story. Like before there's still a lot of sexual tension between Khara and Oz, but now something else is hanging between the two of them, Khara just hasn't figured it out yet. Oz has "upgraded" from fallen to dark one as well, because of this he's pretty much death walking. He's also designated himself as Khara's personal protector and decision maker, even if she doesn't agree. I stated in the last book that Khara isn't TSTL, thankfully this still holds true in this story. I would actually say she's evolved into a better person perhaps, with more emotions and concern for her family. Honestly, from where the first book was heading and the transition into this book I really didn't see the angle in this book until it was nearly finished. I was surprised and delighted when the author decided to take a more unique route with how this story was going to unfold. The evil guys I expected to play a major part in this book didn't, a whole new set of baddies is prowling, but you'll never guess who it is till it's too late. It's pretty much obvious I've fallen in love with this new series, even though it is an urban fantasy and has remained such. I enjoyed this story, I think it's a bit different from most UF series, I feel its more unique and the characters themselves stand out more so than others in this genre. I'd recommend this story to others, you do need to read the first book, otherwise you're just not gonna get it. I received this ARC copy from the publishers in exchange for an honest review. All thoughts and opinions are my own.